Here at Destinations Magazine, we’re conscious that places aren’t experienced in isolation: it’s about the journey, too. 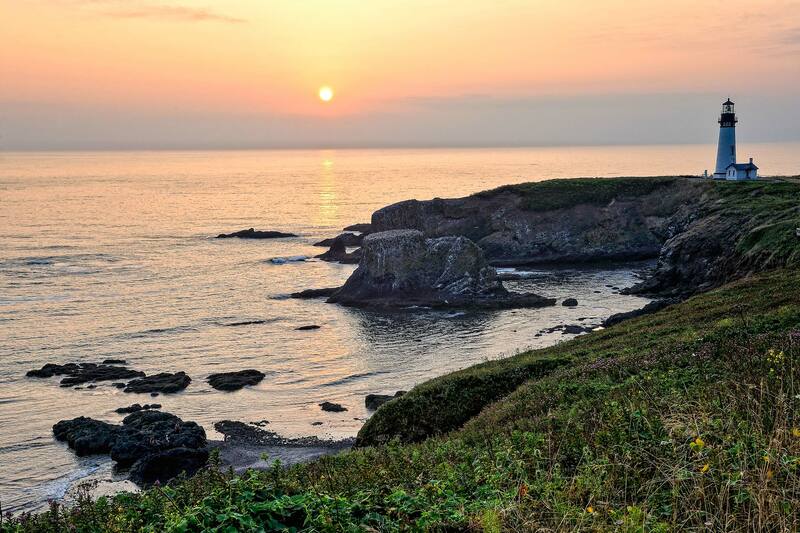 In the second of a four-part series exploring the state of Oregon, we explore the rugged beauty of the Oregon Coast, sampling the freshest seafood and seeking adventure in the sand in Newport and Florence. Antique malls line the highway as we head towards Newport, on the Oregon Coast: if left to my own devices, it’d take me days to make this short trip, rifling through the treasures inside. The proliferation of vintage sellers across the state is the contemporary iteration of Oregon’s pioneer history: the further west one ventured, the fewer supplies were available, so one made do with what was on hand, and nothing was wasted. These tenets of reuse and recycling, along with the importance of local production, now inform the state’s pervasive ‘maker’ culture. The shops gradually become more coastal: beach supplies, seafood, saltwater taffy. I catch glimpses of sea, wild like the weather. With its entire stretch open to the public — no private ownership allowed — this is also known as the ‘people’s coast’. It’s a swathe of different landscapes and microclimates, and driving north to south is the ideal way to explore, pulling over with ease at the many viewpoints along the way. 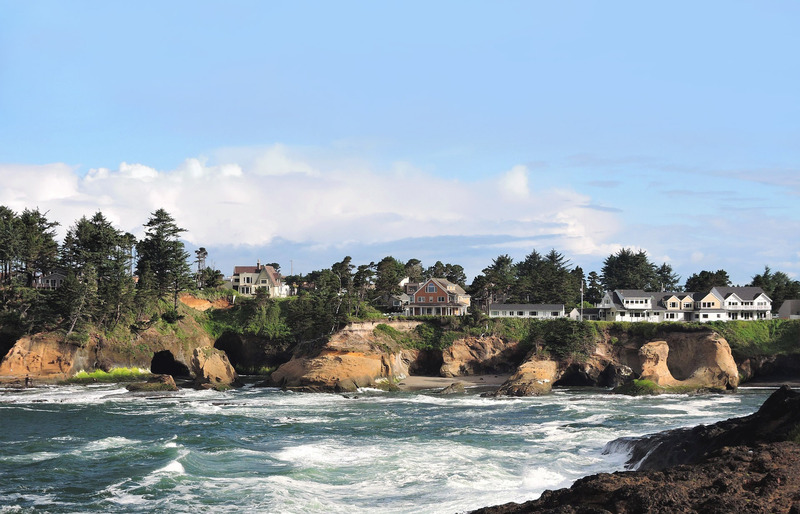 The houses and trees of Depoe Bay sit above the cliff, safe from the waves that pummel the rocks. At Depoe Bay, houses and trees perch on sheer cliffs pummelled by white spray. Huge swells billow towards the bay, the foam thick and cappuccino-frothy. Birds brave the spray, perching on a sea wall. The smallest navigable harbour in the world, it’s often difficult for boats to cross the bar, so unfortunately our group’s intended whale watching trip cannot go ahead today. Still, we check out the whale count for the day, month and year at the Whale Watching Centre: 10 today, 9 yesterday, and 131 so far this month. This town loves its ‘punny’ business names: as we depart, I note the Depoe Baykery and the T-Shirt Depoe, among others. Continuing down the coast, we begin to climb. The cliffs stretch taller. Stopping at the Cape Foulweather lookout, I watch fog rolling in against them, an otherworldly scene. We descend, now driving through that fog, everything in soft focus. Trees are bent from the wind, a few people walk along an otherwise empty beach, and gulls fossick in the sand. 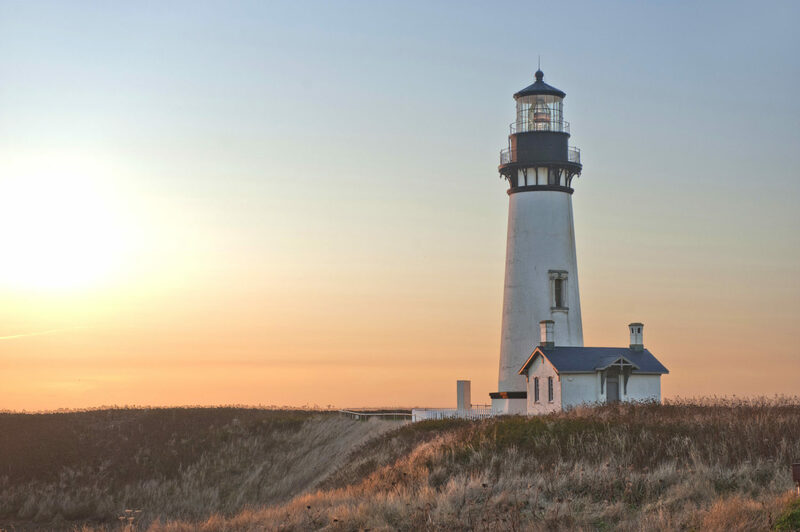 We soon reach Yaquina Head, one of 11 working lighthouses along the Coast. I pick my way down a wooden stairway to the beach, populated with grey pebbles. Large ones give way to small, then finally to patches of fine black sand. Driftwood, seaweed and clutches of mussels are artfully strewn about; a sign informs me that the California mussels say, “Thanks for walking around us.” Cormorants gather on rocky islands just off the beach, staring out to sea, while seals poke their heads curiously out above the water and flick their tails. The setting sun over Yaquina Bay and its iconic lighthouse. The rocks and sand become black and shiny when hit by the tide. I stand and listen to the water scraping over the pebbles: it’s a captivating, memorable sound, almost like a cheer or a rainstick. Walking back up towards the lighthouse, I can taste the waves. The structure is dedicated to those lost at sea: ‘With special affection for the fishermen of the Pacific Northwest’. A touch of green patina on the copper plaque speaks of its exposure to the elements. A crowd gathers, waiting patiently to catch sight of a whale in the bay below: it puffs out a spout of air and slides back beneath. Waves crash on large rocks as if in slow motion, white rivulets running back down as they recede. Reaching Newport Bay, it’s much more placid, though a light layer of mist suggests some horror-film trouble could be brewing. 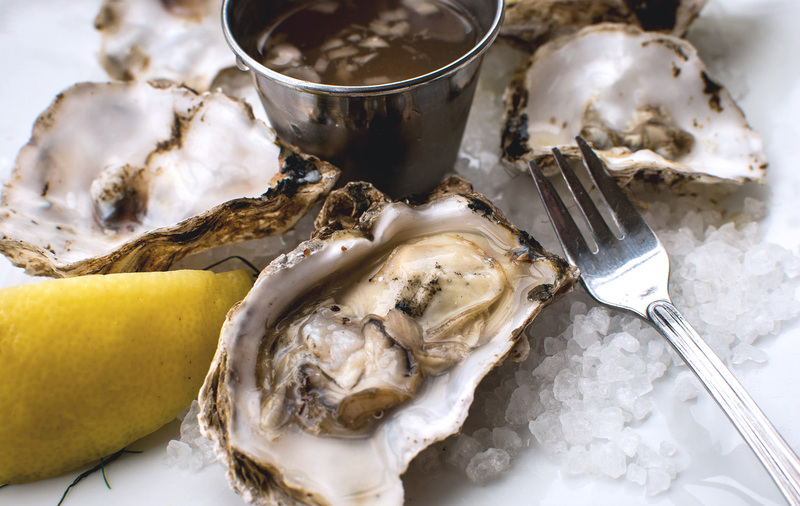 We take a slight detour out to Oregon Oyster Farms: the oldest such establishment in the state — operating since 1907 — they now ship to New York, Boston, and even Taiwan. We watch huge batches of monster shellfish being rinsed and sorted, and taste perfectly fresh, lightly seasoned Pacific oysters, learning that because the oysters filter the water, they’re as good for the estuaries as this environment is for them. We throw the shells onto a beach of the same lining the shore — less a boneyard than a monument to the plenty of these waters and the hard work of those first entrepreneurs who saw the potential here. Returning to central Newport, we check in to the Hallmark Resort, which stretches along the shoreline. Its sitting room — with wide sea view and cosy fire, surrounded by porthole-shaped mirrors and other nautical equipment — seems the perfect place to while away an autumnal afternoon. But we have more active pursuits in mind: it’s time to experiment with fat-tyred bicycles at Bike Newport. A short ride through the streets of this seaside town, and we’re speeding downhill and directly onto Nye Beach. I immediately topple over on the soft sand. Speaking of crabs… Having worked up an appetite, we’re all looking forward to dinner. We stroll along the memorial walk by the port, honouring the Newport fishermen lost at sea since its establishment in 1920. In the background, the beautiful arches of the Yaquina Bay Bridge strike out across the foggy harbour. One can buy all manner of seafood right off the boats docked here, but we’re on target for the famed Local Ocean Seafoods. There are just too many great items on the menu, so we opt to swap and share, dishes all over the table. 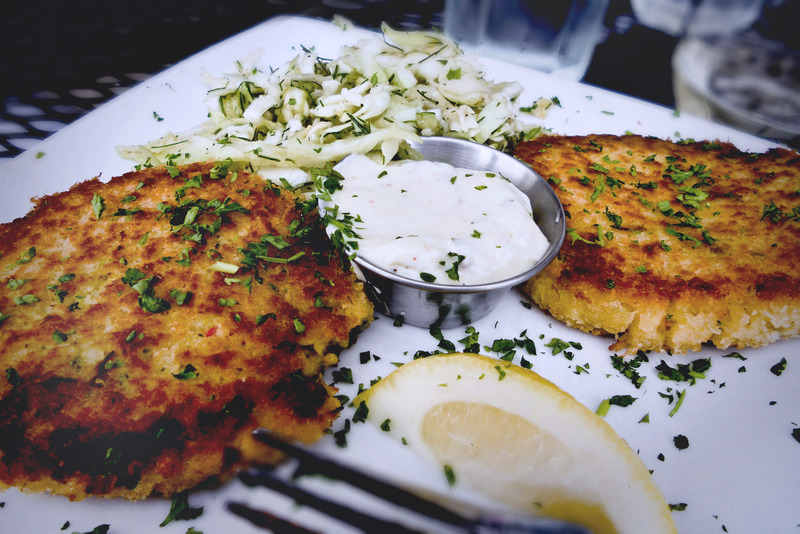 There’s no question we all must try the renowned Dungeness crab cakes with fennel slaw, tartar sauce and lemon, and they don’t disappoint. Fish tacos with chilli-garlic marinade, slaw, and avocado salsa verde are a standout, along with the tuna mignon: bacon-wrapped albacore grilled medium rare, served on a heap of frizzled onions. The fishwives stew — of crab, shrimp, scallops, mussels, clams and fin fish in a rich tomato broth —  and the crab soup, with its creamy clam and parmesan base, also receive honourable mentions. All of this is enjoyed with a fine King Estate Pinot Gris, from the neighbouring Willamette Valley, of course. The sun sets quickly and night falls, lights reflecting off the water. After a nightcap at Nana’s, a cosy Irish pub with an Oregonian twist, I’m ready to retire. I sit out for a bit on my patio, enjoying a Pelican craft beer as spotlights and a bonfire illuminate the sky. The waves roar just metres away. Heading inside the modern, neutrally-furnished room, I open the window so I can hear them in my sleep. I admire the view once more as I dress for breakfast. The crab benedict is tempting but after last night’s indulgences I settle on a croissant with crispy bacon, egg, and local Tillamook cheese, and a fruit cup full of melon, pineapple and berries. Wide windows and large mirrors ensure the ocean is never out of sight. Crossing the Yaquina Bay Bridge, our group’s conversation turns to the dangers of processed food, the benefits of kombucha and raw milk, and the importance of quality coffee. We sweep past rows of cute seaside houses. 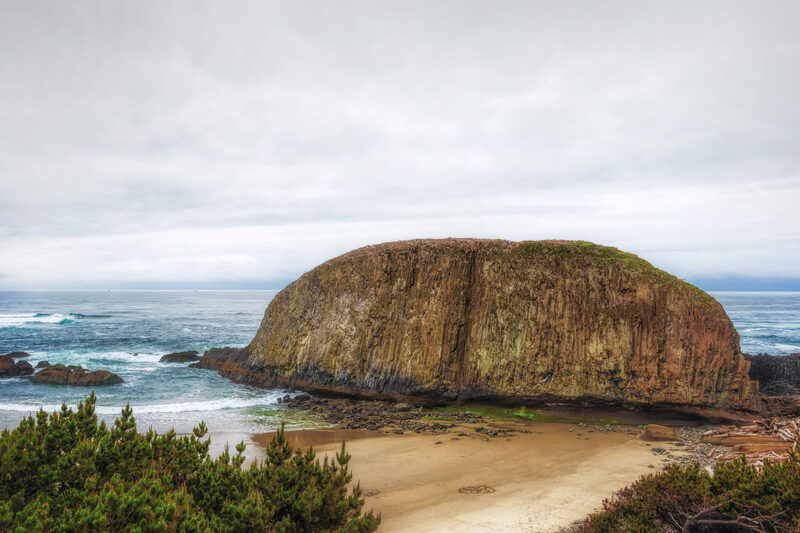 At Seal Rock, large outcrops jut from the sea. Trees lining the highway are reflected in small lakes which make the forest seem even more infinite, stretching out vertically as well as horizontally. The moon is still visible, white in the sky. Winding around Cape Perpetua, the sun works hard to break through the canopy and fog. The jagged treeline’s blurry profile comes into focus as we drive past, each feature revealing itself then disappearing back into obscurity behind. Seal Rock juts out majestically from the sea. We pass by ridiculously picturesque Heceta Head, where the lighthouse perches on a cliff, epitomising scenic isolation. Nearby, the Sea Lion Caves, the largest sea cave in the States, promises hundreds of the eponymous creatures. But we’re on a mission. I spy snatches of the Oregon Dunes from above, rising out of the flat beach. We’re told some are over 100 metres high. I’m incredulous. However, arriving at Sand Dunes Frontier, we buckle into the metal cage of our sandrail — a type of buggy built specifically for this terrain —  and in no time, it’s proven: the dunes are astoundingly high and vast. We speed up a steep slope then drop back down like a rollercoaster. I scream accordingly. The vehicle clings to the side of a dune, almost perpendicular, or so it feels. Sand sprays our faces. We climb over a crest to an epic view: the rippling dunes, a band of forest, then sea. By contrast, at some angles, the view reduces to abstract, essential forms: white sand, solid blue sky, and the bold yellow lines of the buggy cage. After such excitement, I could use a beer, and the timing couldn’t be more perfect. Our time on the people’s coast concludes as we turn inland, following along the Siuslaw River towards the craft brew mecca of Central and Southern Oregon.